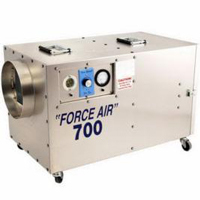 Advanced Containment Systems ACSI FA700 Air Machine – This dependable and durable unit is built and serviced in houston, Texas by advanced containment systems, inc. (ACSI). True hepa filtration. The true hepa filter removes airborne particles down to .3 micron in size with 99.97% efficiency. The unit also uses replaceable primary and secondary filters to improve the life of the hepa filter. The airtight case made of corrosion resistant heavy gage aluminum. Dampened vibration and minimize noise. Easy to operate. Power to the unit is standard 120 Vac using the included 5 ft power cord. The built in Minihelic differential pressure gage coupled with indicator light panel and audible alarm takes the guesswork out of filter replacement. The precision pressure gage reads 0 – 5 inch of water.